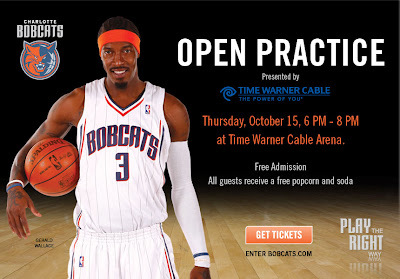 The Charlotte Bobcats are holding an Open Practice on Thursday, October 15 beginning at 6:30 p.m. It's a free event, but to guarantee entry you're asked to register for tickets online. The process (Ticketmaster) takes only a few minutes and you can even print the tickets at home. This is your chance to see what the team (and the Lady Cats) looks like as the regular season approaches. Complimentary popcorn and soda will be served. Click here for tickets. Visit www.bobcats.com for more info.